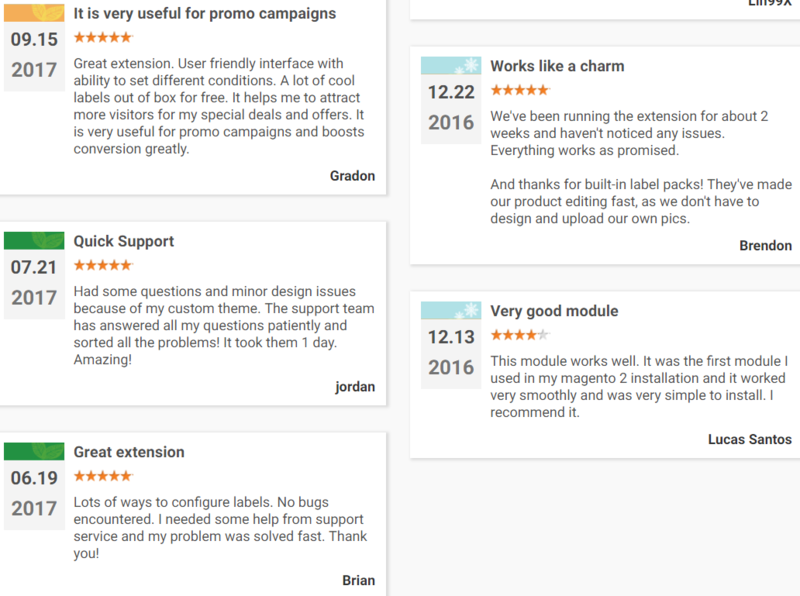 We’ve already reviewed the Product Labels extension by Mirasvit, and now it’s time to shed light on its alternative – Magento 2 Product Labels extension by Amasty. The tool serves for the same purpose: it lets you add bright labels to store items displaying them on product and category pages. Also, the Magento 2 product labels extension calculates percent discounts or flat amounts based on the difference between special and regular price. Besides, there are three rounding algorithms to simplify the way you round discount amounts. But why is it necessary to use ‘on sale’, ‘new’, and other Magento product badges? The reason is obvious: they help to draw customers’ attention to particular items. 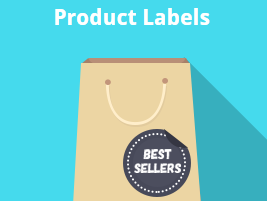 Amasty’s Magento 2 Product Labels extension lets you use predefined variables for label texts. Alternatively, you can upload your own label images. Colorful labels, flexible display conditions, time periods for labels demonstration, variables, and tons of other options provide the ability to customize the module according to literally all ecommerce requirements. Priority value for each label. Amasty allows using product labels in Magento 2, but what specific features does the appropriate module provide? The first and the most important one is the availability of ready-made labels. The Amasty Product Labels Magento 2 extension already includes six packs of labels. It means that you get a plethora of variations to make each new campaign unique. Stickers are in trend and Amasty’s Magento label extension fully copes with it, providing content for Hot Deal, Limited Edition, Black Friday Sale, and more. Besides, the module support SVG files. 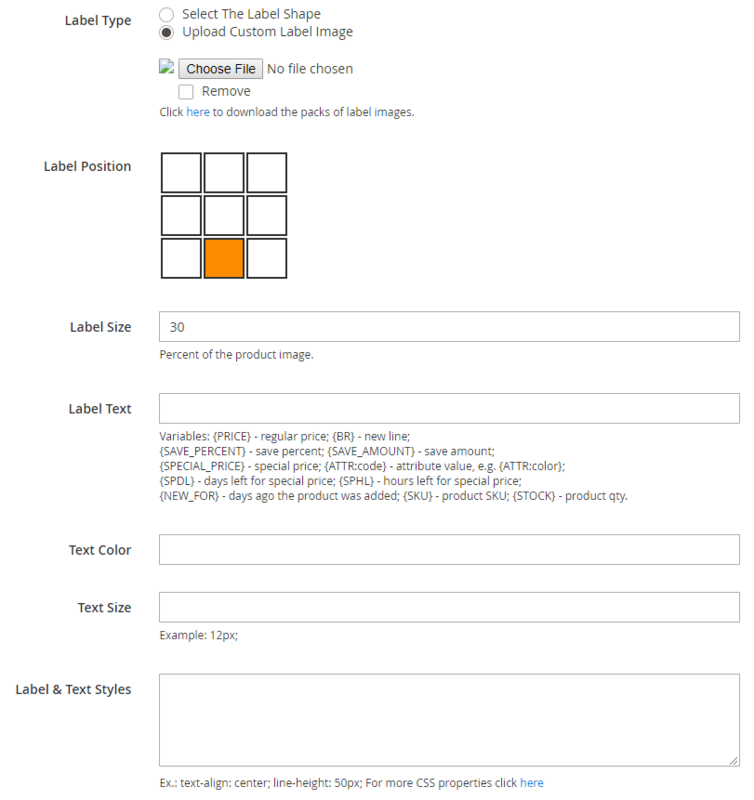 If you need something really unique (and want to spend time and effort on creating completely new content), the Magento 2 product label module allows generating your own Magento product labels based on already provided shapes. Alternatively, you can upload your own backgrounds. Also, you can use the opportunity to promote particular brands and upload their logos to place on the product images. 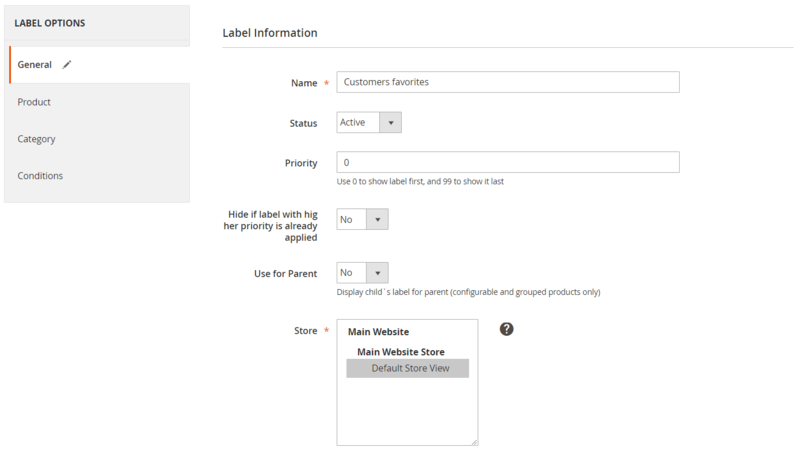 Another vital feature provided by Amasty Product Labels for Magento 2 is the ability to preview how labels look on the frontend right in the admin interface. With product labels, Magento products become more appealing to store visitors, but you should avoid mistakes, so backend preview is the only way to eliminate omissions. 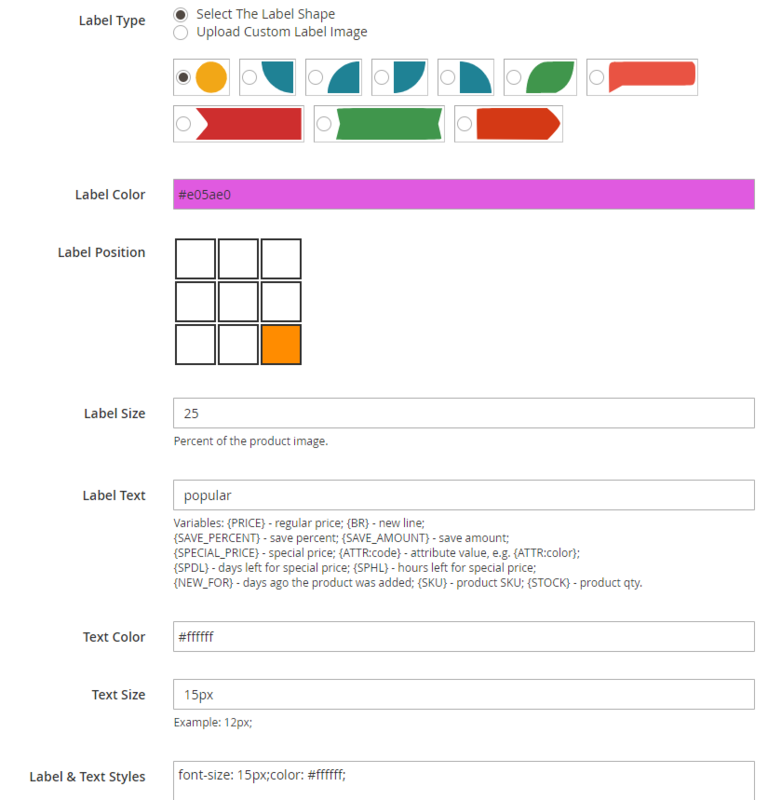 As for label display conditions, they are extremely flexible with the Amasty Magento label module. 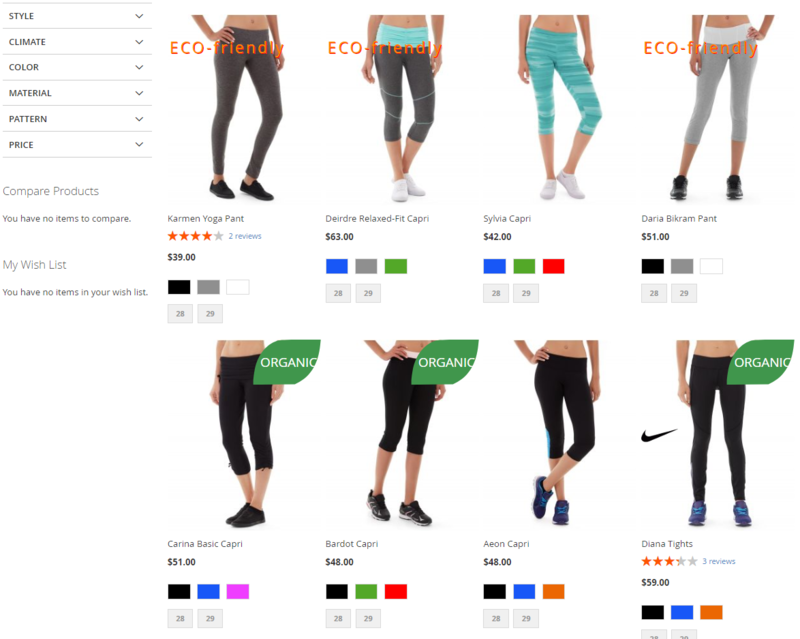 The Magento 2 Product Labels extension allows you to leverage product attributes and attribute sets, product categories and SKUs, emphasize new and on sale products, as well as display labels only when the stock level value is lower than a certain amount. Add the ability to set time periods for label display, use priorities, implement customer group-based display, and leverage variables – you will get the almighty Magento 2 product labels extension. For example, selecting data range lets you highlight the events occurring on your store by placing specific labels like Black Friday or Christmas Sale. 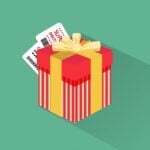 Using customer group options, you can display a Free Gift badge for your loyalty program participants, or set other conditions according to your marketing strategy. 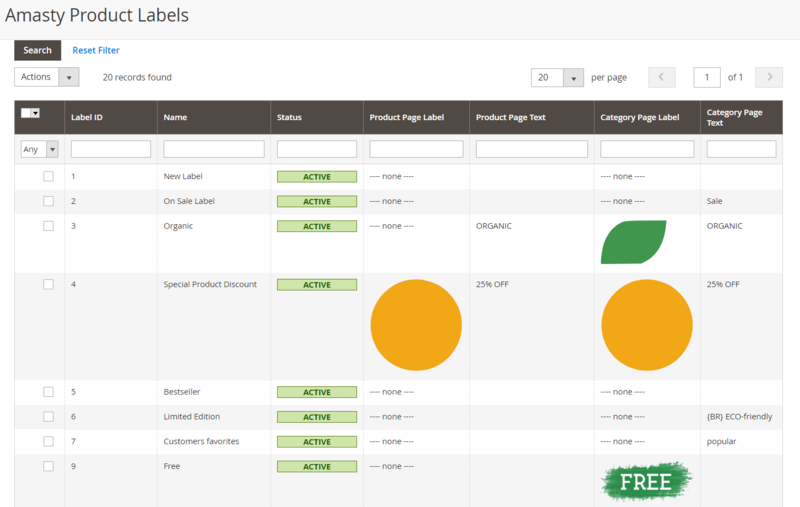 All Magento 2 labels are gathered in a grid that displays Label ID, Name (e.g., New Product, Sale, 10% discount, and other), Status, Product Page Label (label image for product pages), Product Page Text (variables for text displayed on product page label images), Category Page Label (label image for category pages), and Category Page Text (variables for text displayed on category page label images). All columns support sorting and filtering. Their order can be rearranged as well. When adding a new label, you will deal with three tabs of options: General, Product, Category, and Conditions. Under the General tab of the Magento 2 product labels extension, specify such core label information as Name, Status (Active/Inactive), and Priority (0 is for the highest priority, and 99 is for the lowest). Besides, you can enable the feature that hides the label if another one with higher priority is applied. Another interesting parameter – Use for Parent – displays a child’s label for the parent product (note that it works for configurable and grouped products only). Finally, you should decide to which store view to apply the label. The extension also requires specifying text color and size and customizing label and text styles using CSS (e.g., color:red; font-size:12px; etc.). Note that the same options are available for both product and category pages. 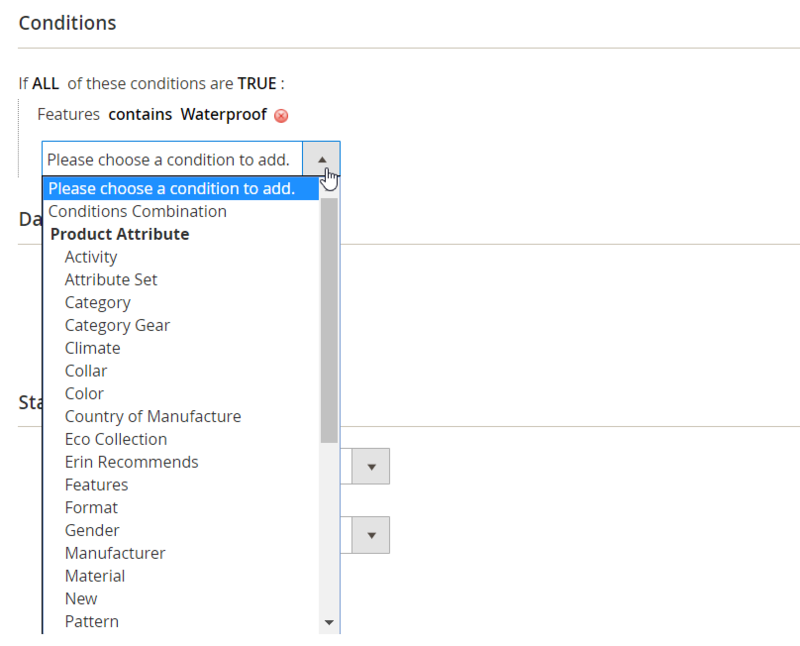 As for the Conditions tab of the Magento 2 product labels module, it lets you make the selection of products for applying the label to make its display more precise. The tab is divided into several sections. In the first one, you will deal with the expression if ALL/ANY of these conditions are TRUE/FALSE. The second section is designed to specify a date range. 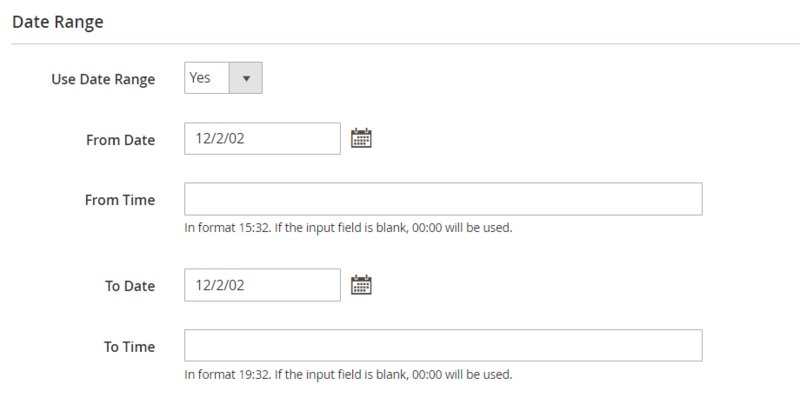 Activate the feature, and you will get four new fields: From Date, From Time, To Date, To Time. Next, fine-tune the state of items to which you are going to apply the label. In the State section, the Magento 2 product labels extension offers two options: Is New and Is on Sale. For each one, you should choose one of three parameters: Does not matter, Yes (display the label), No (do not display the label). For On Sale option, you can also allow using only special price. In the Stock section, you should decide which role a stock status plays: Does not matter, Out of Stock, or In Stock. You can also enable using stock range to make the labels dependant on the stock quantity. In the next two fields, enter the inventory values that will trigger the display of the label. 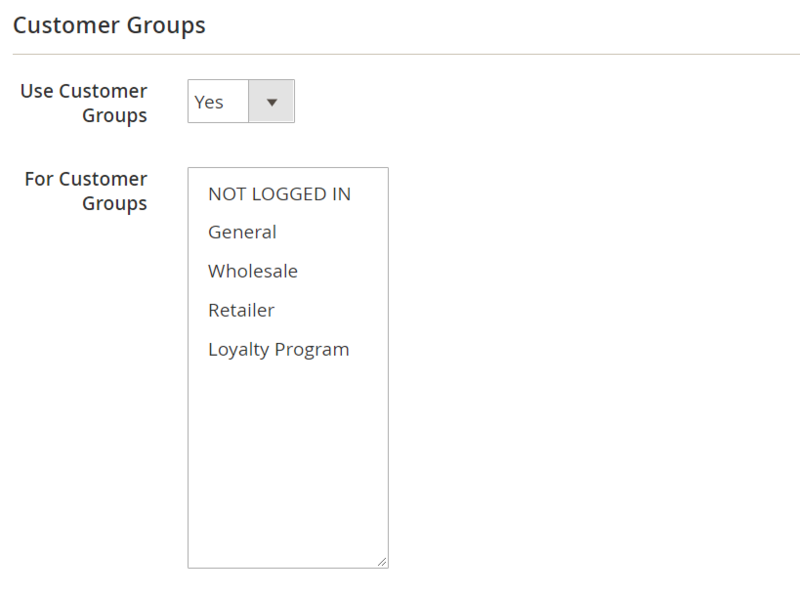 The final section lets you choose customer groups that will see the label. As for the Product Labels extension’s configuration, it consists of three sections: Display Settings, ‘On Sale’ Condition, and ‘Is New’ Condition. In Display Settings, specify containers (DOM-selectors) for product and category pages – Product Page Label Container and Category Page Label Container. Here you can also enable using indexes for the labels display which will improve the performance of your web store. ‘On Sale’ Condition lets you specify the minimal discount amount and minimal discount percentage. Besides, you can choose the rounding of the discount percentage (the next lowest/highest integer value or by rules of mathematical rounding) with this Magento 2 product labels module. ‘Is New’ Condition allows using such parameters as Use ‘New from Date’ and ‘New to Date’ and Use ‘Creation Date’. It is also necessary to specify a threshold in days for new products if you enable the Creation Date option. New function: indexer can be used now to improve the performance of catalog products listing and label preview performance in the backend. The SVG image type is supported now. A new feature was implemented: now you can display labels for products within a specific quantity range. Performance optimization was made: a cache for the labels block was added. Text without images as a label can be added now. As you can see, Amasty offers a very convenient tool designed to draw the attention of your customers to various goods. The Magento 2 product labels extension has simple but yet powerful backend settings and attractive appearance on the frontend of both Magento 2 and Magento 1. As for the price of the Product Labels module, it depends on the platform version. Thus, the Magento 1 plugin costs just $99, while its descendant has a slightly higher price tag – $149.